Perry Township families have long known that we are committed to providing a high quality education to our growing student population. Now we are honored that education advocates across the state, and even the nation, are starting to notice. The National Institute for Excellence in Teaching (NIET) is generously helping to spread the word about out student success. In October 2018, NIET founder Lowell Milken honored our district with the organization’s first-ever National Award of Excellence for Educator Effectiveness, which included a $50,000 cash prize. Since then, school districts and education organizations have talked to our teachers and administrators to learn about our unique approach to teaching. 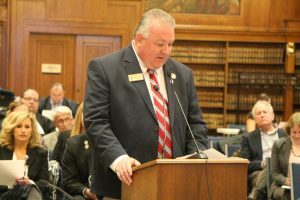 Earlier this month, Superintendent Pat Mapes and assistant superintendents Bob Bohannon and Vickie Carpenter addressed the Indiana State Board of Education. They presented the Board with a robust presentation that detailed our diverse population, professional development strategy, and student results. They emphasized how our teaching standards are implemented as early as preschool so even our youngest students can develop literacy and math skills to ensure they are ready to learn in kindergarten. NIET leaders also addressed the Board to explain how our district is setting an important standard. They described Perry Township Schools as an anchor NIET-partner district in the Midwest region and as an example of the positive outcomes that occur when districts focus continuous improvement goals in the areas that matter most for kids. 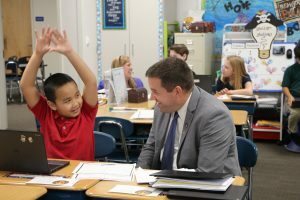 A few days later, Southport Elementary hosted senators Jeff Ratz and John Crane, as well as representatives from Indiana State Teachers Association, Stand for Children, Indiana State Board of Education, Indiana Association of School Principals, and NIET. Our teachers explained how weekly professional development has led to our students’ growth across subjects. Our guests also spent time inside several classrooms so they could see, firsthand, how our teachers engage with students and how our students respond. One example of our results is illustrated between 2015-16 and 2017-18 when our students increased their ISTEP+ passing rate from 49.1 percent to 51.3 percent, surpassing the state’s passing rate. Notably, while Indiana’s passing rate declined during this timeframe, our district’s rose. Our teachers have seen tremendous growth among our English Learners (EL) students, as well. According to spring 2018’s World-Class Instructional Design and Assessment (WIDA)—which measures multilingual readers—47 percent of our EL population reads at a Level 5, the most proficient level. This result represents a 21 percent increase over the previous year. NIET’s partnership with Perry Township Schools started with two schools—Southport Elementary and Abraham Lincoln Elementary—in 2010. The schools’ progress led Perry to expand the innovations districtwide. For more information about our NIET partnership, visit niet.org.